Pyracantha, commonly known as scarlet firethorn, is a large and versatile ornamental shrub which can attain a natural height to 15 feet and more. It is a fast grower and can be adapted into your landscape as a specimen, background planting, formal hedge, and even espaliered against a wall. Pyracantha is everygreen and will thrive in zones 5 through 9. It is not particular, but prefers rich sandy and well drained soil in full or partial sun. It will also grow in part shade, but flowering and berry production will be sparse. The foliage is evergreen consisting of dark green shiny leaves one to two inches long. Limbs and twigs are armed with numerous long and sharp thorns. Flowering occurs in late spring to early summer on previous season's wood. A well-grown plant will be literally covered in clusters of creamy white, delicately fragrant blossoms. The individual fruit is a small berry about the size of a pea and produced in tight clusters. The berries gradually ripen to a spectacular showy bright orange display in mid to late autumn. Propagation is by cuttings or seeds. Pruning should be done in early spring before new growth appears. However, it may be done at any time during the year. The thing to remember that flowers are produced on previous years growth. 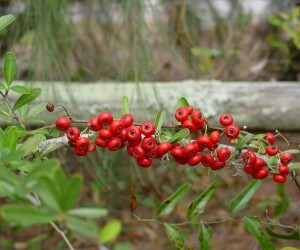 Be selective in pruning pyracantha if you expect berries the following season. In some location and under very dry conditions plants are attacked by spidermite and need to be sprayed to prevent foilage from dropping. Pyracantha is also subject to fireblight which is a very destructive and hard to combat bacterial disease that will usually kill the plant. Several newly introduced hybrids are resistant to this disease. Some of these cultivars have also been bred to a more compact form as well as variations in the color of the berries ranging from pale yellow through dark scarlet. Birds, especially robins and bluejays are very much attracted to the colorful firethorn berries and will literally stuff themselves until they can barely get off the ground. We are fortunate to have a large family of wild turkeys living year-round in our area. They also love the berries which they pick by flying up to balance on the branches or by jumping up to rip off their meal. Once the turkeys find the crop, it is usually gone in a couple of days, so we have none left for christmas decorations.